Here at Eagle National Steel, we have everything it takes to help you complete your project--and this includes skid steer loaders! Eagle National Steel is your trusted source for all your steel needs, but we can also provide you with the rest of the tools for the job. 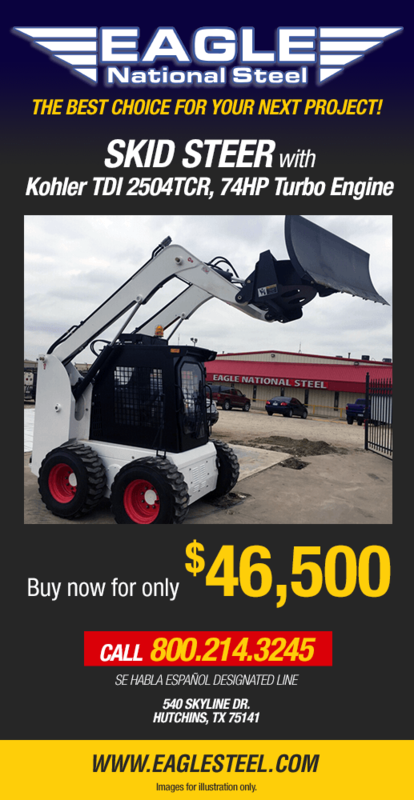 The skid steer loader we offer comes with a Kohler diesel engine. Kohler has been around since 1920; since then, they've continued their dedication to making quality engines that provide machines with the power they need to get the job done. Skid steer loaders are an excellent choice for all kinds of building and construction needs. They take up much less space--and cost less--than a larger excavator, and they can actually do a much better job in certain spaces. With a rated operating capacity of 2,535 pounds, high flow hydraulics, and hydraulic joystick control, you'll find that our skid steer loader is a great tool for the job. What's more, the enclosed deluxe cab with an air conditioner means that you'll have an enjoyable work experience! Whether you're interested in learning more about the benefits of skid steer loaders or you've already decided to go with one, we're glad to help here at Eagle National Steel. Why Trust Eagle National Steel with Your Next Project? Eagle National Steel is one of the nation's most accommodating Steel Service Centers--but we're so much more than that! We have two convenient locations in the Dallas/Fort Worth Metroplex area, but we're also glad to ship to wherever you are. We started off as a small family business, and we keep that spirit alive today. Whether you're part of a big company looking for truckloads of steel or a local customer who wants to build a small structure, you'll get the same level of attentive customer service. Of course, we carry more than just steel, and we're happy to help you with whatever you need for your project. Contact us at Eagle National Steel to find out more!